The government now requires that a nutrient label be included on food packages and as a result, there is a wealth of important information on the outside of the package that gives you a clue about the nutritional value of what can be found inside of the package. This section of a nutrient label will show you the “Serving Size” and the number of “Servings per container.” This information is worthy of your consideration, because you need to know the actual amount of the food that will provide the nutrition promised in the rest of the label. How big is your ice cream scoop? For instance, say this is an ice cream food label. The serving size established by the FDA for ice cream is ½ cup. You need to be aware that this amount and only this amount of ice cream (which is not much by most people’s standards!) will supply the calories, fat, etc. that are listed on the rest of the label. Just once, take a half-cup measure and see what a serving really looks like in your bowl. Then you will know, for future reference, if you are eating more or less than the “serving size” listed on the label. You should only have to do this one time, and then you will be able to choose your portion wisely. How many bowls will it take? This works the other way, too. If you are trying to get enough fiber or other nutrient, make sure you are aware of the serving size that provides the amount of that nutrient listed on the label. For instance, if you are hoping to get fiber from a product such as breakfast cereal, check the label to see the serving size that provides the listed amount of fiber and adjust your menu accordingly. Thinking of drowning your sorrows with a whole carton? If you want to know how much of a nutrient is found in the entire container, just multiply the number of “Servings per container” by the amount of the nutrient per serving. For instance, a half-gallon container of ice cream contains 16 one-half cup servings (i.e. “Servings per container”) and, perhaps, has 200 calories per serving. The entire container would contain 3,200 calories (16 x 200). Caveat for Nutrient Label: One device that food companies have recently employed is to reduce the serving size, without changing the product, so that it will appear to have fewer calories and/or fat. For instance, some drinks and snacks, which seem to be packaged as a single serving, will actually contain two “servings”. If you only glance at the calorie content and not the serving size, you may be fooled into consuming more calories and fat than you intended. The FDA has tried to minimize this problem by establishing serving sizes for some foods. In the case of potentially harmful ingredients, such as trans fats, the food company may reduce the serving size to a small enough amount that they are able to claim that it is “free of trans fats,” instead of removing the trans fats altogether. Don’t be fooled! This section of the nutrient label is probably of the most concern to the most people. It tells you how many “Calories” there are in a serving. We all know that calories are a way of measuring energy that is supplied by food. We also know that, generally, if you don’t use up all of the energy supplied by the food you eat, your body may store the excess as body fat. This part of the label allows you to consciously know how many calories you are consuming of a particular food, and also, to consciously avoid high calorie foods, if that is your desire. You can also compare various versions or brands of a particular food, to see how the calories stack up. In addition, the number of those “Calories from fat” is listed, so that you can see if the food gets most or all of its calories from fat. You will find that certain foods, such as cream cheese and mayonnaise get most of their calories from fat, while foods such as vegetables and fruit, get almost none of their calories from fat. This information allows you to plan your menus to include the appropriate amounts of foods that have a large percentage of their calories provided by fat. If you are trying to lose weight or have digestive issues concerning fat, you can use this part of the nutrient label to make food choices that address these concerns. This is probably the most complicated and therefore least understood portion of the nutrient label. It is also the section of the label that varies the most based on which nutrients are plentiful in the particular food that is in the package. Major nutrients (Fats, Carbs and Protein) plus Sodium are usually listed first, followed by the other micronutrients (Vitamins and Minerals). You will see that there are two numbers listed for each nutrient on the label. The first number is usually in grams (g) or milligrams (mg) and tells you the actual amount of the nutrient that is found in one serving of the food product. This number is very useful if you know your daily requirement for a particular nutrient. For instance, most people need about 25-30 grams of fiber each day, so if a serving of the product provides 1.5 grams you will need to eat more servings or find other sources of fiber in your food choices for the day. The number in the left column tells you the “Percentage Daily Value” of the nutrient. That number will tell you that if you eat an average diet of 2,000 calories, one serving of the product will provide the listed percentage of your needs for this nutrient. For instance, in the case of dietary fiber, if the product supplies 1.5 g of fiber, that would be about 6% of the fiber you would need in a day, if you consume an average diet of 2,000 calories. The thing to remember is that this number is only useful in a general sense, because the amount of these nutrients needed will vary based on such things as caloric needs (more or less than 2,000), health status, age, gender and whether you are pregnant or nursing. This number is helpful when you glance at a label to give you a general idea of the nutrient content of the food. If this number is very low (under 5%), the food is not a great source, if the number is higher, the food product would be a better source of that nutrient, and if the number is 20% or above, it is an excellent source of the nutrient. It is required that the nutrient label list the fat content found in a serving of the product, including the amount of the fat that is “Saturated,” and the amount of “Trans-fats.” This information will help you plan your menus to include more of the healthy fats (generally, unsaturated*) and fewer of the less healthy fats (generally, saturated*), and to avoid the really bad actors (trans-fats) as much as possible. For more information on Fats and Cholesterol, please click on this link. All nutrient labels will have “Sodium” listed and some also include “Potassium” in this section.This is particularly useful to those of you who are watching your sodium intake due to high blood pressure and/or salt sensitivity. The average recommended intake of sodium for adults is 1200-1500 mg per day. For Potassium the average recommend intake is 4500-4700 mg per day. For more information on Sodium, please click on this link. For more information on Potassium, please click on this link. 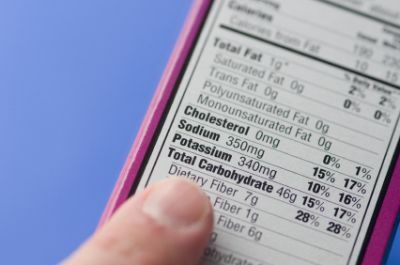 In addition, this part of the nutrient label will tell you the total amount of Carbohydrates in a serving. This number is broken down into “Sugars” and “Fiber,” and sometimes, “Other carbohydrates” or “Starches.” My guess is that the fiber number is the one that most people look at, since fiber has for many become a cause for concern in recent years. However, the “Sugars” number gives you a good idea of the ratio of sugar to protein and fat in the product, so it can be useful in planning your menus. For more information on Carbohydrates, please click on this link. The third major nutrient is Protein, which is generally listed after Carbohydrates on this portion of the nutrient label. This number may be more or less important depending on the type of diet you consume. Vegetarians, vegans and athletes should pay particular attention to this information, but it is useful to anyone who is concerned with the quality of the foods they eat. For more information on Protein, please click on this link. The second part of this section of the nutrient label lists vitamins and minerals that can be found in the food product. The variety of the listings here will vary based on the product inside the package, but listings for the following vitamins and minerals are required. Even if you don't specifically note what the food label says about the content of each vitamin and mineral, you can get an idea of the nutrient density of the food by the number and amounts of these nutrients. In addition, if your medical professional has recommended that you get more of a certain nutrient, you can easily check the label for that particular nutrient content. This portion of the food label gives you a little synopsis of the recommended daily values for selected nutrients for a 2,000-calorie diet and a 2,500-calorie diet. 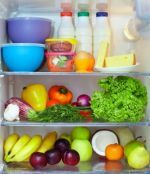 It is important to remember that this is general information that is only intended as a useful guideline to determine how the food product generally fits into the nutrient picture. It also provides a quick reference for you to get an idea of the amount of the listed nutrients that is recommended each day. For instance, you can see that it is recommended that you get about 25-30 g of fiber each day, lest you think that you needed as much as 80 g (and find yourself uncomfortable, digestively speaking) or only 4 g (not enough to keep things moving). The food label on packaged foods is only as valuable as your willingness to take advantage of the information found there. When you have scarce resources to spend on food for yourself and your family, it seems wise to use all the information at your disposal to make good choices. Even if you choose some less nutritious foods at times, because they are fun or taste good, the knowledge of where they fit into a healthy diet can be invaluable. Take the time to be healthy and stay well. Click here to go from Food Labels 2 page to Other Names for MSG page.